We must try our character by the moral standard, God’s holy law. Day by day we must measure our attainments, to see if we shall be of this number. “Thou hast a few names, even in Sardis, which have not defiled their garments, and they shall walk with Me in white; for they are worthy” [Revelation 3:4]. “By this time the 144,000 were all sealed and perfectly united. On their foreheads was written, God, New Jerusalem, and a glorious Star containing Jesus’ new name. [Revelation 3:12.] At our happy, holy state the wicked were enraged, and would rush violently up to lay hands on us to thrust us in prison, when we would stretch forth the hand in the name of the Lord, and the wicked would fall helpless to the ground. Then it was that the synagogue of Satan knew that God had loved us who could wash one another’s feet, and salute the holy brethren with a holy kiss, and they worshipped at our feet. [Revelation 3:9.] Soon our eyes were drawn to the East, for a small black cloud had appeared about half as large as a man’s hand, which we all knew was the Sign of the Son of Man. [Matthew 24:30.] We all in solemn silence gazed on the cloud as it drew nearer, lighter, and brighter, glorious, and still more glorious, till it was a great white cloud. [Revelation 14:14.] The bottom appeared like fire, a rainbow was over it, around the cloud were ten thousand angels singing a most lovely song. And on it sat the Son of Man, [Luke 21:27.] on his head were crowns, [Revelation 19:12.] his hair was white and curly and lay on his shoulders. [Revelation 1:14.] His feet had the appearance of fire, [Revelation 1:15.] in his right hand was a sharp sickle, [Revelation 14:14.] in his left a silver trumpet. [1 Thessalonians 4:16.] His eyes were as a flame of fire, [Revelation 1:14.] which searched his children through and through. Then all faces gathered paleness, and those that God had rejected gathered blackness. Then we all cried out, who shall be able to stand? Is my robe spotless? Then the angels ceased to sing, and there was some time of awful silence, [Revelation 8:1.] when Jesus spoke. Those who have clean hands and a pure heart shall be able to stand, my grace is sufficient for you. At this, our faces lighted up, and joy filled every heart. And the angels struck a note higher and sung again while the cloud drew still nearer the earth. Then Jesus’ silver trumpet sounded, as he descended on the cloud, wrapped in flames of fire [2 Thessalonians 1:7, 8] He gazed on the graves of the sleeping saints, then raised his eyes and hands to heaven and cried out, [John 5:25.] Awake! Awake! Awake! ye that sleep in the dust, and arise. Then there was a mighty earthquake. The graves opened, and the dead came up clothed with immortality. The 144,000 shouted, Hallelujah! as they recognized their friends who had been torn from them by death, and in the same moment we were changed and caught up together with them to meet the Lord in the air. [1 Thessalonians 4:17.] We all entered the cloud together, and were seven days ascending to the sea of glass, when Jesus brought along the crowns and with his own right hand placed them on our heads. [2 Esdras 2:43.] He gave us harps of gold and palms of victory. [Revelation 15:2. Revelation 7:9.] Here on the sea of glass the 144,000 stood in a perfect square. Some of them had very bright crowns, others not so bright. Some crowns appeared heavy with stars, while others had but few. All were perfectly satisfied with their crowns. And they were all clothed with a glorious white mantle from their shoulders to their feet. [Revelation 7:9.] Angels were all about us as we marched over the sea of glass to the gate of the City. Jesus raised his mighty glorious arm, laid hold of the gate and swung it back on its golden hinges, and said to us, You have washed your robes in my blood, stood stifly for my truth, enter in. [Isaiah 26:2.] We all marched in and felt we had a perfect right in the City. Here we saw the tree of life, and the throne of God. Out of the throne came a pure river of water, and on either side of the river was the tree of life. [Revelation 22:1, 2.] On one side of the river was a trunk of a tree and a trunk on the other side of the river, both of pure transparent gold. At first I thought I saw two trees. I looked again and saw they were united at the top in one tree. So it was the tree of life, on either side of the river of life; its branches bowed to the place where we stood; and the fruit was glorious, which looked like gold mixed with silver. We all went under the tree, and sat down to look at the glory of the place, when brothers Fitch and Stockman, who had preached the gospel of the kingdom, and whom God had laid in the grave to save them, came up to us and asked us what we had passed through while they were sleeping. We tried to call up our greatest trials, but they looked so small compared with the far more exceeding and eternal weight of glory [2 Corinthians 4:17.] that surrounded us, that we could not speak them out, [Isaiah 65:17.] and we all cried out Hallelujah, heaven is cheap enough, and we touched our glorious harps and made heaven’s arches ring. And as we were gazing at the glories of the place our eyes were attracted upwards to something that had the appearance of silver. I asked Jesus to let me see what was within there. In a moment we were winging our way upward, and entering in; here we saw good old father Abraham, Isaac, Jacob, Noah, Daniel, and many like them. And I saw a vail with a heavy fringe of silver and gold, as a border on the bottom; it was very beautiful. I asked Jesus what was within the vail. He raised it with his own right arm, and bade me take heed. I saw there a glorious ark, overlaid with pure gold, and it had a glorious border, resembling Jesus’ crowns; and on it were two bright angels—their wings were spread over the ark as they sat on each end, with their faces turned towards each other and looking downward. [Exodus 25:18, 20. Hebrews 9:3-5.] In the ark, beneath where the angels’ wings were spread, was a golden pot of Manna, of a yellowish cast; and I saw a rod, which Jesus said was Aaron’s; I saw it bud, blossom and bear fruit. [Numbers 17:8.] And I saw two long golden rods, on which hung silver wires, and on the wires most glorious grapes; one cluster was more than a man here could carry. And I saw Jesus step up and take of the manna, almonds, grapes and pomegranates, and bear them down to the city, and place them on the supper table. I stepped up to see how much was taken away, and there was just as much left; and we shouted Hallelujah—Amen. We all descended from this place down into the city, and with Jesus at our head we all descended from the city down to this earth, on a great and mighty mountain, which could not bear Jesus up, and it parted asunder, and there was a mighty plain. [Zechariah 14:4.] Then we looked up and saw the great city, with twelve foundations, twelve gates, three on each side, and an angel at each gate, and all cried out, “the city, the great city, it’s coming, it’s coming down from God, out of heaven;” [Revelation 21:10-13.] and it came and settled on the place where we stood. Then we began to look at the glorious things outside of the city. There I saw most glorious houses, that had the appearance of silver, supported by four pillars, set with pearls, most glorious to behold, which were to be inhabited by the saints; [Isaiah 65:21.] in them was a golden shelf; I saw many of the saints go into the houses, take off their glittering crowns and lay them on the shelf, then go out into the field by the houses to do something with the earth; [Isaiah 65:21.] not as we have to do with the earth here; no, no. A glorious light shone all about their heads, and they were continually shouting and offering praises to God. And I saw another field full of all kinds of flowers, and as I plucked them, I cried out, well they will never fade. Next I saw a field of tall grass, most glorious to behold; it was living green, and had a reflection of silver and gold, as it waved proudly to the glory of King Jesus. Then we entered a field full of all kinds of beasts—the lion, the lamb, the leopard and the wolf, altogether in perfect union; [Isaiah 11:6-9.] we passed through the midst of them, and they followed on peaceably after. Then we entered a wood, not like the dark woods we have here, no, no; but light, and all over glorious; the branches of the trees waved to and fro, and we all cried out, “we will dwell safely in the wilderness and sleep in this woods.” [Ezekiel 34:25.] We passed through the woods, for we were on our way to Mount Zion. As we were travelling along, we met a company who were also gazing at the glories of the place. I noticed red as a border on their garments; their crowns were brilliant; their robes were pure white. As we greeted them, I asked Jesus who they were? He said they were martyrs that had been slain for him. With them was an innumerable company of little ones; they had a hem of red on their garments also. [Jeremiah 31:15-17. Matthew 2:18.] 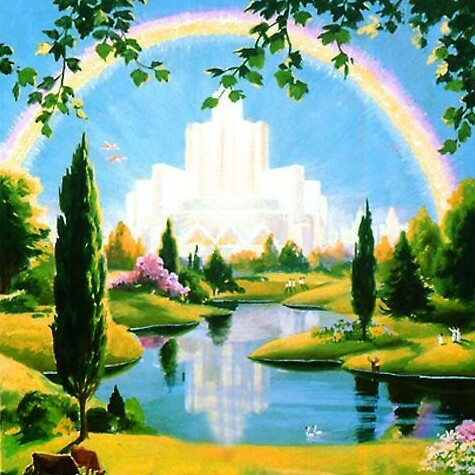 Mount Zion was just before us, and on the Mount sat a glorious temple, and about it were seven other mountains, on which grew roses and lilies, [2 Esdras 2:19.] and I saw the little ones climb, or if they chose, use their little wings and fly to the top of the mountains, and pluck the never fading flowers. There were all kinds of trees around the temple to beautify the place; the box, the pine, the fir. the oil, the myrtle, the pomegranate, and the fig tree bowed down with the weight of its timely figs, that made the place look all over glorious. [Isaiah 60:13. Isaiah 41:19.] And as we were about to enter the holy temple, Jesus raised his lovely voice and said, only the 144,000 enter this place, and we shouted Hallelujah.